Covering close to seventy nautical miles and jumping a state line at least four times, this three day trip introduced a couple of new sailors to the crossing of open stretches of water ruled by strong tidal currents. 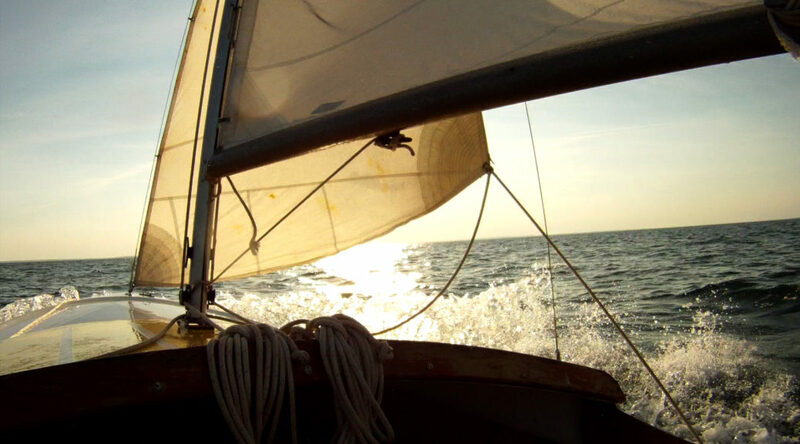 From the mouth of the Connecticut River, we crisscrossed Eastern Long Island Sound, Block Island Sound, and Gardiner’s Bay, passing through both Plum Gut and the Race. After an initial serious bout with motion sickness was finally vanquished by one in our party with massive pluck, we all enjoyed breezes often light enough for swimming and napping underway, and sometimes strong enough to make things exciting and prompt our taking in a reef. The days were long, leaving little time or energy for proper shore wanderings, but the marshes we stopped in in Connecticut and on Long Island’s South Fork were beautiful, and the people we met friendly. Sweet summer sailing! Thank you, Perl and LT!